Parnassia palustris var. tenuis Wahlenb. 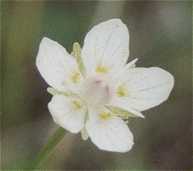 Flowers: white, 5-parted, 3/4"-1" wide, petals 1/2 to 2 times longer than the triangular sepals; solitary; blooms July-Aug.